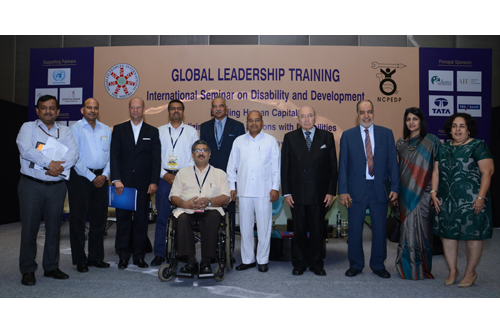 From L – R: A. S. Narayanan, Vice President, DPI India; Nishant Pandey, India Country Director, American India Foundation; Sanjay Singh, Principal Resident Representative, Tata Sons Ltd, Delhi; Javed Abidi, Global Chair, DPI; Thaawar Chand Gehlot, Hon’ble Minister for Social Justice & Empowerment, Government of India; Ambassador Luis Gallegos, Chair, G3ict Board of Trustees & Former Chair, CRPD Preparatory Committee of the UN General Assembly; Mukhtar Al Shibani, President, GAATES; Neerja Singh, Group EVP & Regional Head (North & East), Responsible Banking, YES BANK Ltd.; Kanchan Pamnani, Trustee, NCPEDP. 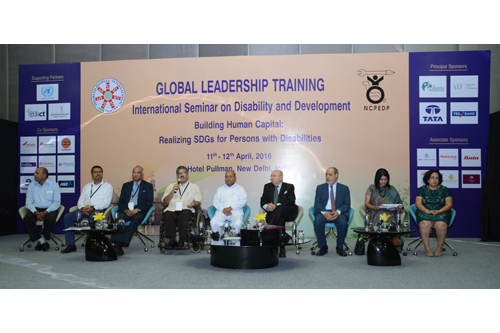 From L – R: Awanish Awasthi, Joint Secretary, Department of Empowerment for Persons with Disabilities (DEPwD), Ministry of Social Justice and Empowerment (MSJE); A. S. Narayanan, Vice President, DPI India; Yuri Afanasiev, UN Resident Coordinator & UNDP Resident Representative, India; Nishant Pandey, India Country Director, American India Foundation; Javed Abidi, Global Chair, DPI; Sanjay Singh, Principal Resident Representative, Tata Sons Ltd, Delhi; Thaawar Chand Gehlot, Hon’ble Minister for Social Justice & Empowerment, Government of India; Ambassador Luis Gallegos, Chair, G3ict Board of Trustees & Former Chair, CRPD Preparatory Committee of the UN General Assembly; Mukhtar Al Shibani, President, GAATES; Neerja Singh, Group EVP & Regional Head (North & East), Responsible Banking, YES BANK Ltd.; Kanchan Pamnani, Trustee, NCPEDP. 11th April, 2016, Presentation by Masayoshi Nakamura, President & CEO, JINRIKI Co. Ltd.
11th April, 2016, G3ict and Advocacy Training by Shilpi Kapoor, Founder & Director, BarrierBreak Solutions Pvt. Ltd. And James Thurston, Vice-President for Global Strategy and Development, G3ict. From L-R: Ekaete Umoh, DPI Nigeria; Pravesh Panchoo, DPI Mauritius; Marissa Lee, DPI Singapore; Reshma Valliappan, Founder – Director, The Red Door; Nidhi Goyal, Disability & Gender Rights Activist. From L-R: Senarath Attanayake, Uva Provincial Councillor & Attorney-at-Law, Sri Lanka; Amon Anastaz, DPI Tanzania; Dayana Martinez Gisell Burke, Vice President, DPI Latin America Region; Sylvanna Lakkis, Chairperson, DPI Arab Region; Dr. P.K. Gopal, President, IDEA India; Mohamad Sazali Bin Sha Ari, DPI Malaysia. From L-R: Wilber Torrez Morales, Chairperson, DPI Latin America Region; Trevor Carroll, DPI Australia; Javed Abidi, Global Chair, DPI; Mohammed Ali Loutfy, Executive Director, DPI Arab Region; Henrietta Davis-Wray, Chairperson, DPI North America & Caribbean Region; Alzouma Maiga Idriss, Vice Chair, African Disability Forum.